Learn how to create a wonderful Chinese dragon drawing with this stunningly easy step by step tutorial! 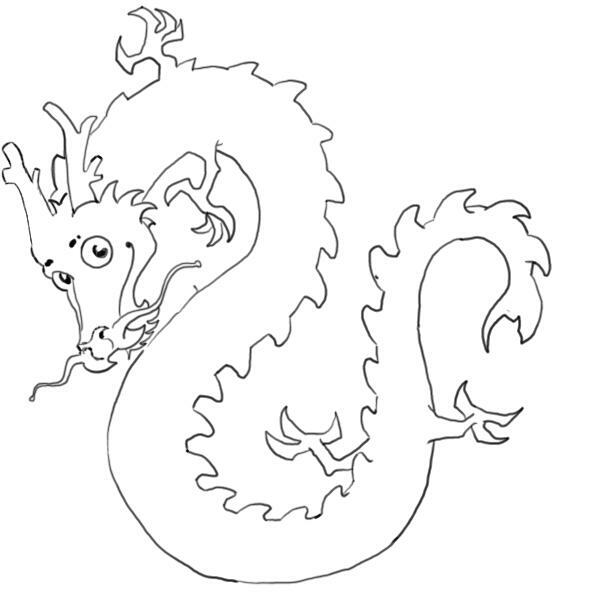 If you can realize a chinese dragon drawing you are on the route to becoming a great drawer. These amazing mythological creatures can be difficult to draw due to the sinuous shape of their body and the ornaments that traditionally accompanies the different body parts. 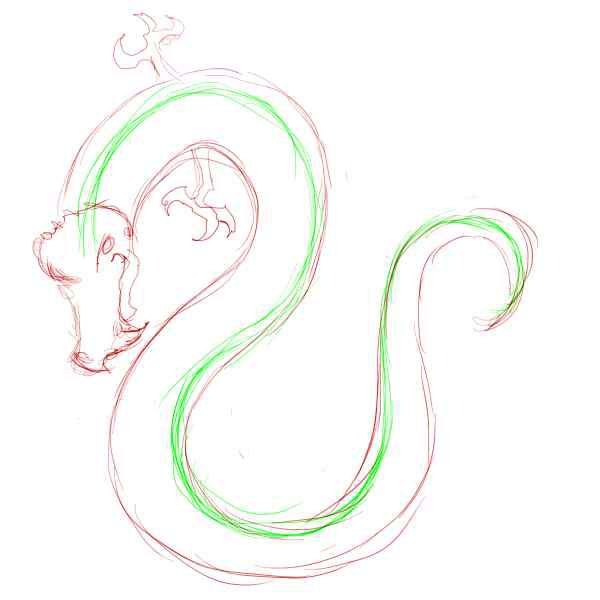 We will realize a powerful yet simple drawing of a chinese dragon. It will capture the essence of these imaginary creatures but it will be a simplified and more iconic version of the more traditional representation. 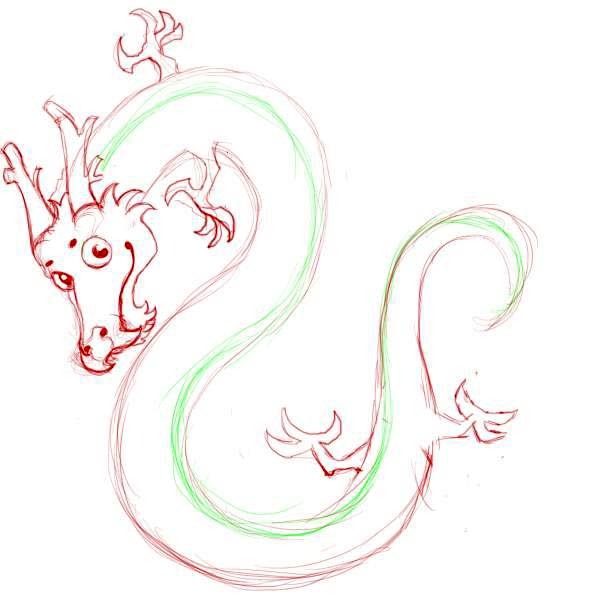 Chinese dragon drawing – Watch those curves! 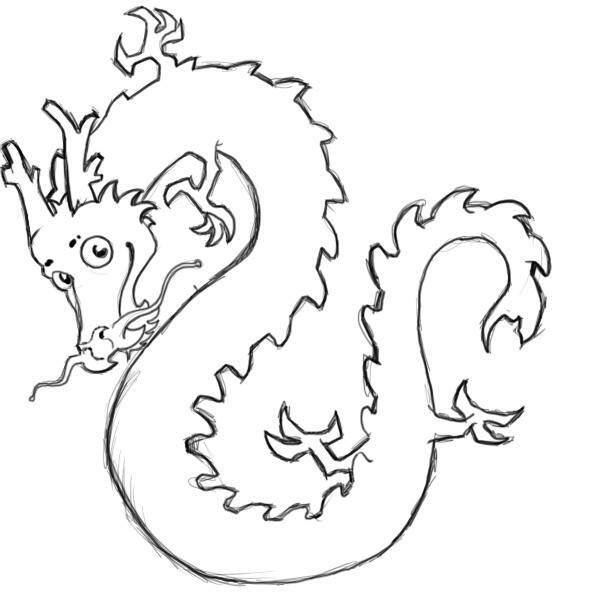 The first thing you want to define when drawing a chinese dragon are the curves of his body. The chinese dragon has a snake-like body contrarily to the Western dragon and it is crucial that you get those curves right. They do not have to be exactly like mine but you need to capture the sinuous nature of our dragon friend. So, start by drawing a single line and make sure this lines develops with smooth curves and bends from the top to the end. The next step will be to add a sketchy version of a head, a couple of claws and the actual body. 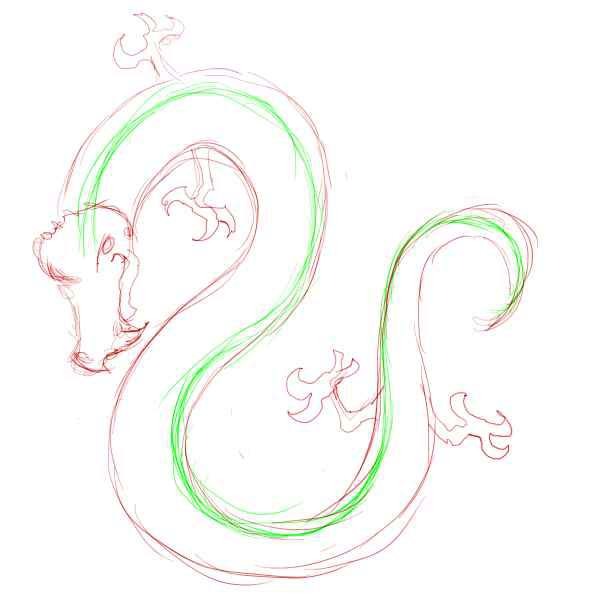 The useful thing about the (green) line we have used to define the curves of the dragon is that we can now use that same line to define the spine of the dragon itself. This will be useful to position the limbs and subsequently to position the scales that run along the spine. In yin and yang terminology, a dragon is yang (male) and complements a yin (female) fenghuang or “Chinese phoenix”. This step is to show you how I have decided to positions the legs. You can follow if you want or not but when you draw them, try to go with the flow of the body when you position them. As you can see I have worked on the face a little bit here. This is not the first version I came up with, actually I have tried and redrawn it many times, but it is the version that I liked the most. It would be futile to ask you to copy my version of the dragon face becaus I think you should come up with your own. Just google chinese dragon and search for traditional pictures of the chinese creature and get inspired. Try to come up with your personal interpretation of this creature. 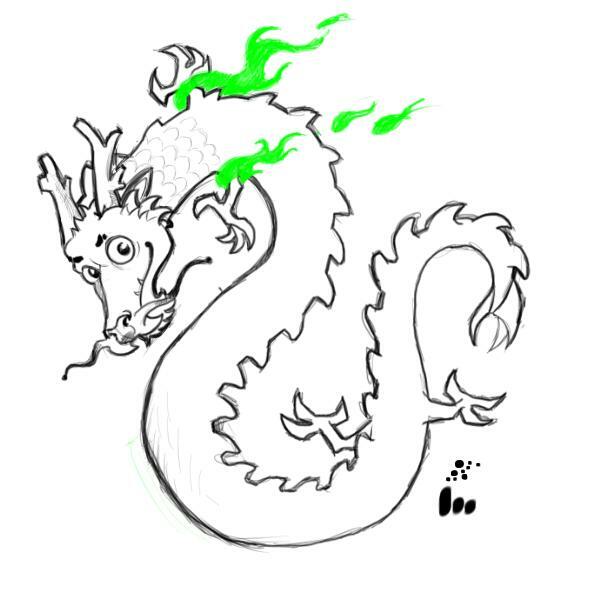 If you search around you might notice that the dragon is sometimes represented with a very angry expression and aggressive aspect however I have decided here to soften it up and rendering a friendly and lovable chinese dragon. If you have gotten this far with your drawing now it’s time to elaborate a little bit your sketch to get an idea of the final result. Without doing anything fancy I elaborated the head a little and the front legs and given them a posture that make them look more like hands than legs. This is how they are often represented in traditional drawings. Posterior legs have also changed from the previous sketch. Now! I told you the spine would have come in handy! It’s time to add the dorsal scales to our dragon. I can assure you that it would be a nightmare if we didn’t have the dorsal spine. We can in fact use the spine as a reference and as a guide to draw the scales because we know where the base of the scales is. Draw the scales slowly and try to keep them all similar to each other. Also try to follow the curvature of the body when you draw them. We are getting there my friends! 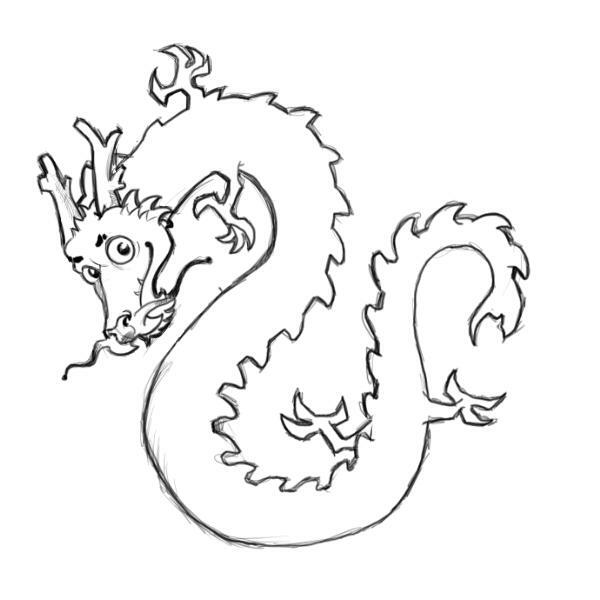 At this point you can just trace the profile of your dragon and remove all the construction and sketchy lines. I know it looks a bit naked now but trust me we are going to make it look professional in a sec, just follow me! 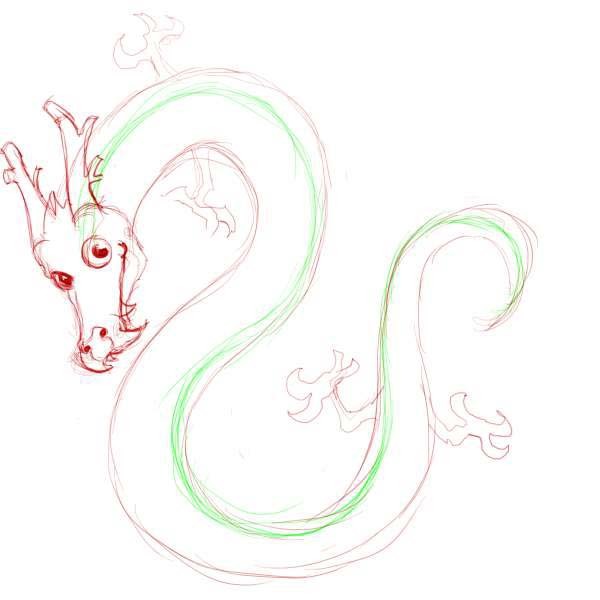 Chinese dragon drawing. The first thing to do is to give a bit of character to the outline. To do it, just go over it with your pencil with an “artistic” motion. Try not to be to precise, let some of the lines to wander outside of the outline until you recover that nice sketchy feeling that it had before. Just re-dimensioned it to make it fit better into the canvas. Also I have redrawn the head in a slightly different position in order not to have it too close to the body. 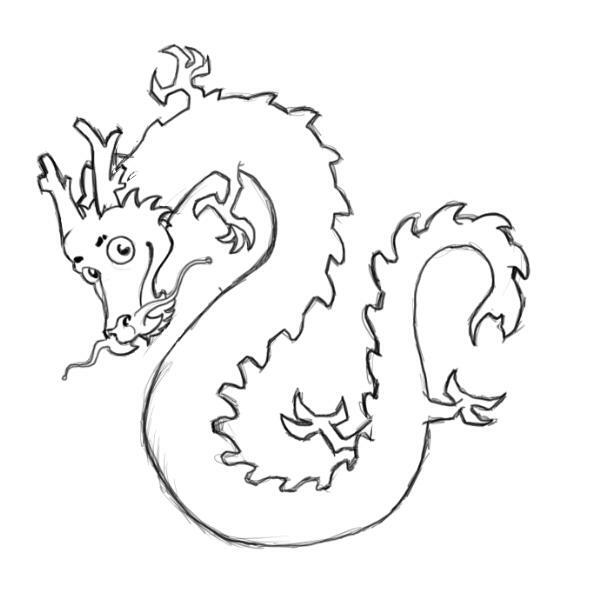 Give more artistic love to those contour lines, add detail to the head and body, color the whiskers and your chinese dragon is almost done! The dragon is sometimes used in the West as a national emblem of China. However, this usage within both the People’s Republic of China and the Republic of China on Taiwan as the symbol of nation is not common. Instead, it is generally used as the symbol of culture.The dragon is also a symbol of power and strength. The final touch to our beautiful chinese dragon drawing is going to be some scales here and there to give the impression of their presence on the entire body and the small mystical clouds that the Dragon uses to fly! 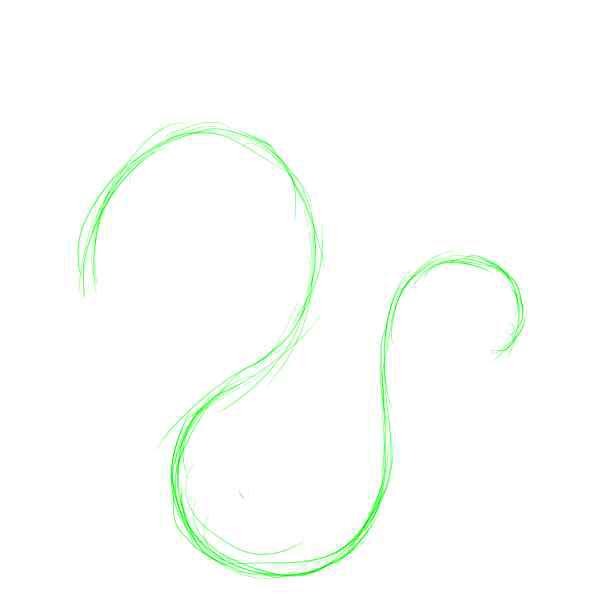 I hope you enjoyed this tutorial my friends and that you have learned how to make a chinese dragon drawing. I will see you all on the next one! !